Epiphone has announces the all-new Epiphone limited-edition Tony Iommi Signature SG Custom, designed by the "Godfather of Heavy Metal" himself and featuring Gibson USA Tony Iommi Signature Humbuckers, a 24-fret Ebony fingerboard, and a beautiful Ebony gloss color finish. Tony Iommi is every guitar player's hero. He's not just the "lead guitarist" of BLACK SABBATH. He i BLACK SABBATH. BLACK SABBATH was inducted into the Rock And Roll Hall Of Fame in 2006 but he's been every shredder's idol since BLACK SABBATH's debut in 1970. For 45 years as the band's heart and soul and the originator of dozens of all-time classic riffs, Tony Iommi has helped to make the "SG" the iconic guitar for hard rock and heavy metal. Now, Epiphone presents a one-of-a-kind SG designed exactly to Tony Iommi's specifications. The limited-edition Tony Iommi Signature SG Custom: The limited-edition Tony Iommi Signature SG Custom has a classic-styled SG body made from Mahogany with a gloss Ebony color finish and a 3-layer black/white/black pickguard. The 24.75" scale Mahogany neck has white binding and our popular 1960s SlimTaper™ D-profile that's glued into the body with a deep-set neck joint with a smooth transition heel. 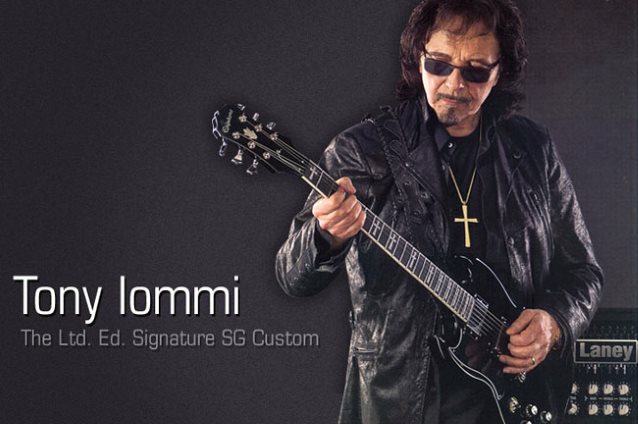 Gibson USA Tony Iommi Signature Humbuckers: For his new limited-edition signature Epiphone, the "Godfather of Heavy Metal" chose his own Gibson USA Tony Iommi Signature Humbuckers for both the lead and rhythm positions. The Tony Iommi Signature Humbucker was Gibson's first Signature Series pickup and features both Alnico II and Ceramic magnets with special windings for an incredible sustain and full-shred tone. Each pickup is fully wax-potted and epoxied for absolute protection against unwanted feedback. Both pickups are powered by SG-style controls with Black "Top Hat" knobs with metal inserts and an Epiphone all-metal 3-way pickup selector with a black toggle cap. Rock Solid Hardware: As with all Epiphones, the limited-edition Tony Iommi Signature SG Custom comes with rock solid nickel hardware including a rim-mounted Epiphone Heavy-Duty chrome metal jack plate, premium die-cast machine heads with a 14:1 ratio and Metal Tulip Buttons, and a classic LockTone Tune-o-matic bridge Stopbar tailpiece for incredible sustain and reliability. Limited Lifetime Guarantee: Each Epiphone limited-edition Tony Iommi Signature SG Custom comes with a hand signed Certificate of Authenticity, binder, and photograph. And like every Epiphone, Tony Iommi's Signature SG comes with world famous 24/7/365 Gibson Customer Service and Epiphone's Limited Lifetime Warranty.